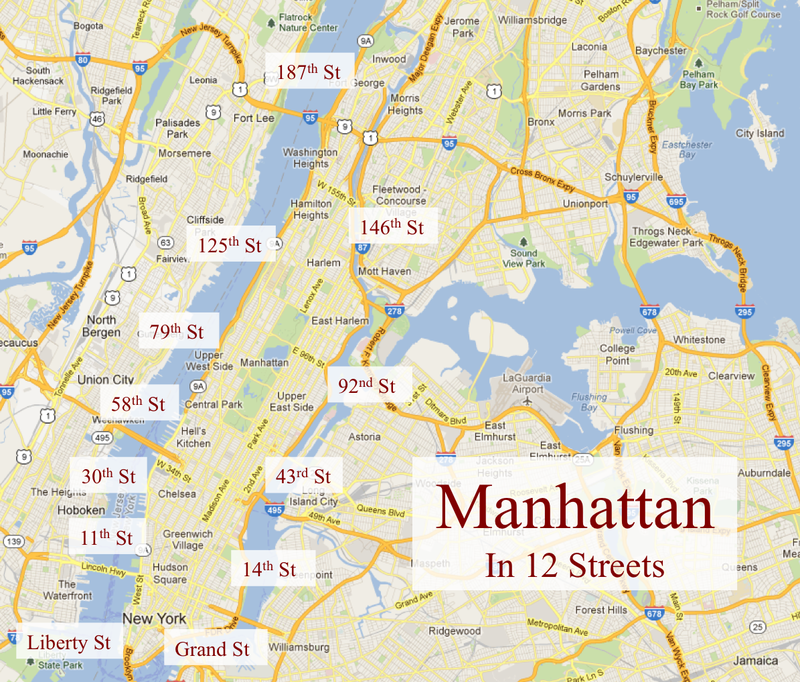 Manhattan In 12 Streets is a narrative and photographic account of Manhattan from the point-of-view of its streets, some important, some less so. The intent is not to provide an accurate picture of the state of the urban and human landscape on this small island. Nor is this project a guidebook presenting alternative walking tours of the city. The aim is to use Manhattan – specifically 12 of its streets – as a means to playfully deconstruct the genre of walking tours and urban sociological studies; to use this city as a blank slate on which to impose my own wayward interpretations of The City as a concept. Along the way, the history, architecture, politics and spirit of Manhattan may creep into my narratives, they being intimately associated and rooted in place. However, being ultimately accounts of Manhattan from the point of view of an outsider, these narratives may contain very little that is familiar to the average New Yorker, and may, at times, be annoyingly, willfully off-kilter, if only to incite the reader to abstract from the obvious to see what’s implied. Many others have written extensively online about Manhattan’s streets and landmarks of a more ephemeral nature. Some of these are extremely informative and detailed walking tours of Manhattan’s streets, avenues and neighborhoods, accompanied with stunning photography. I have listed the most inspiring of these sites – to which I am indebted for much historical and architectural information – in the Introduction to this project. In the meantime, here are the chapters to this Tale of Manhattan. A new chapter, profiling a new street, will be published here on Dream Of A City once a month. All words and photography are mine. Epilogue: Goodbye Empire State, Hello Lion City!